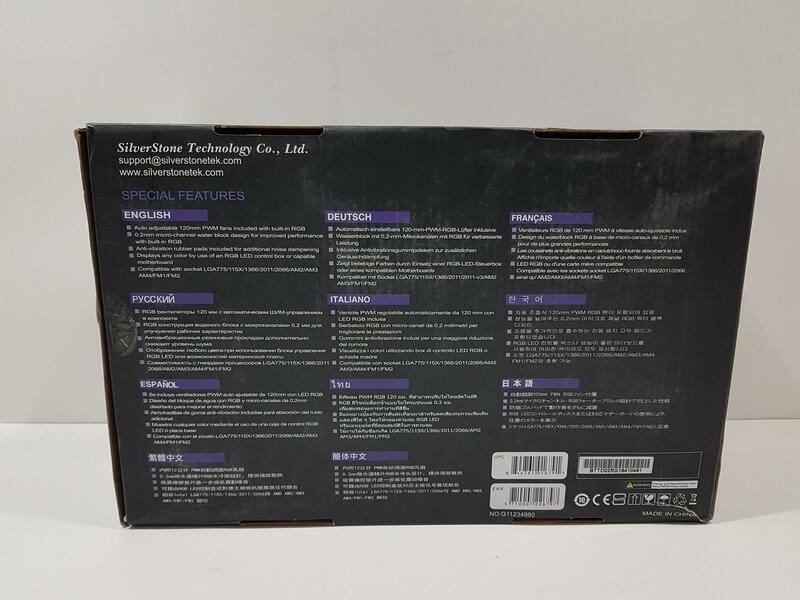 The product is shipped inside a cardboard box. Unfortunately, this shipment from SilverStone was badly handled by the Customs and the boxes were delivered in bad shape as can be seen from the pictures. The front side has SilverStone brand name and logo printed on the top. Tundra Series TD-02 RGB is printed on the top right. 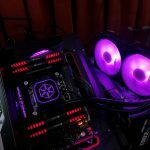 There is a picture of the unit on the main section with fans and the block lit in purple color. 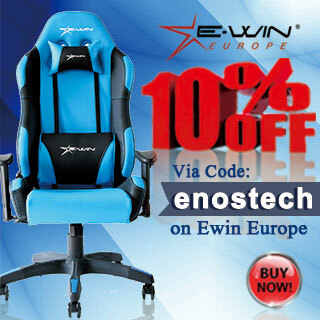 All-in-one RGB liquid cooler with excellent price-performance ratio. The bottom side of the packing box has salient features of the cooler printed in 11 languages. UPC and EAN info labels are printed at the bottom right along with the serial no sticker. 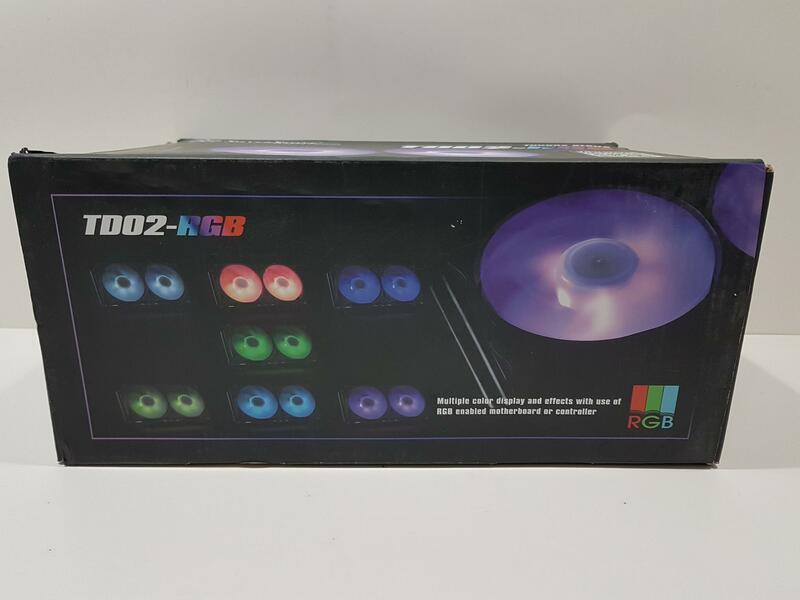 The front side of the packing box has TD-02 RGB printed on the top left side. Pictures of the unit in multiple colors are printed on the main section highlighting the RGB nature of the unit which can be controlled through the motherboard. The backside of the packing box has TD-02 RGB printed on the top left. 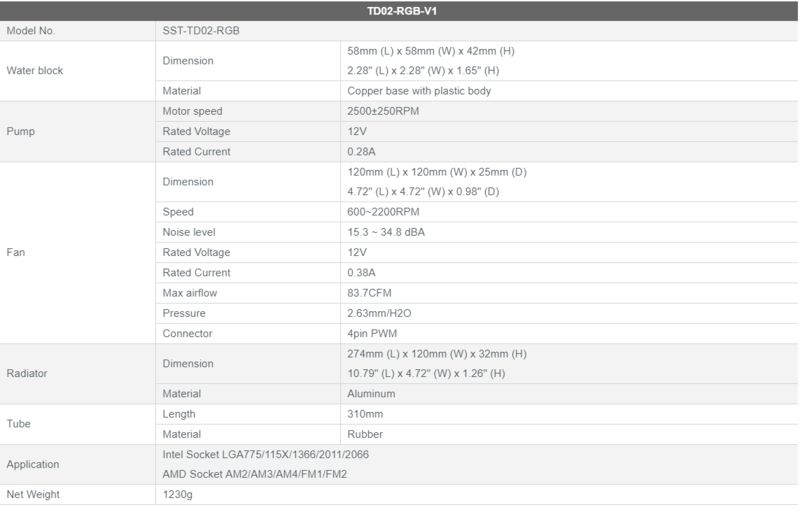 The specifications of the product are printed in tabular format on the left side whereas the picture of a fan is printed on the right side. The left and right sides are identical. 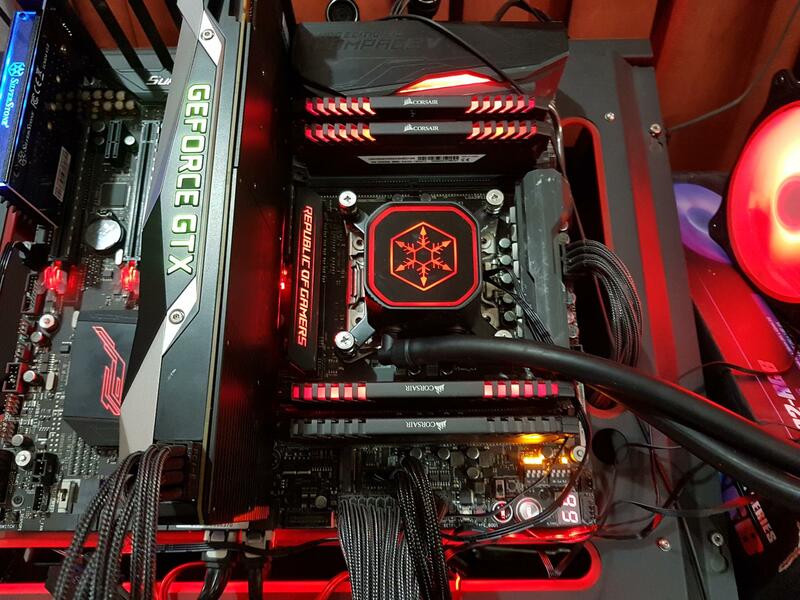 SilverStone brand name and logo are printed on the top left. Tundra Series TD-02 RGB is printed on the main section. The contents of the box are placed inside egged box carton of typical brown color. It is time to take a closer look at the unit. 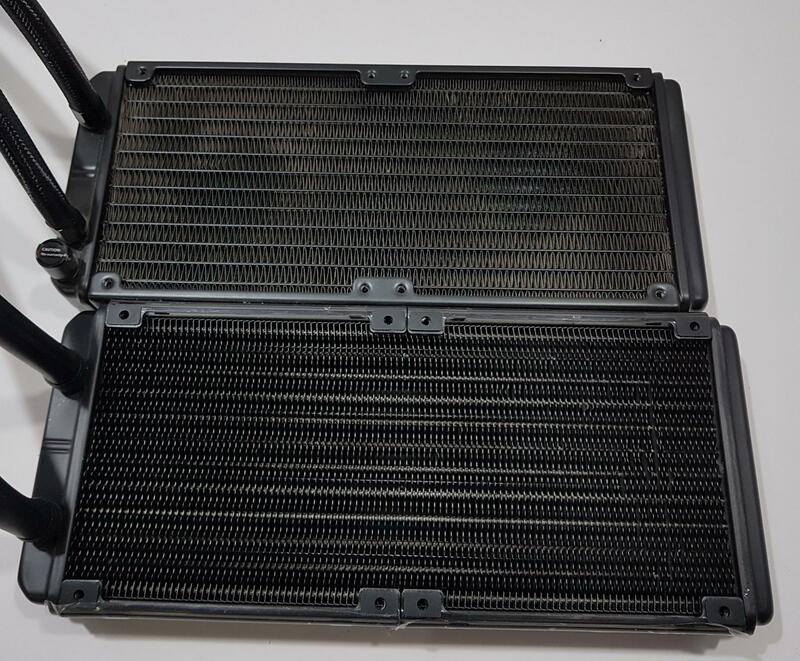 The radiator is made of Aluminum as is the case with the majority of the AIOs. 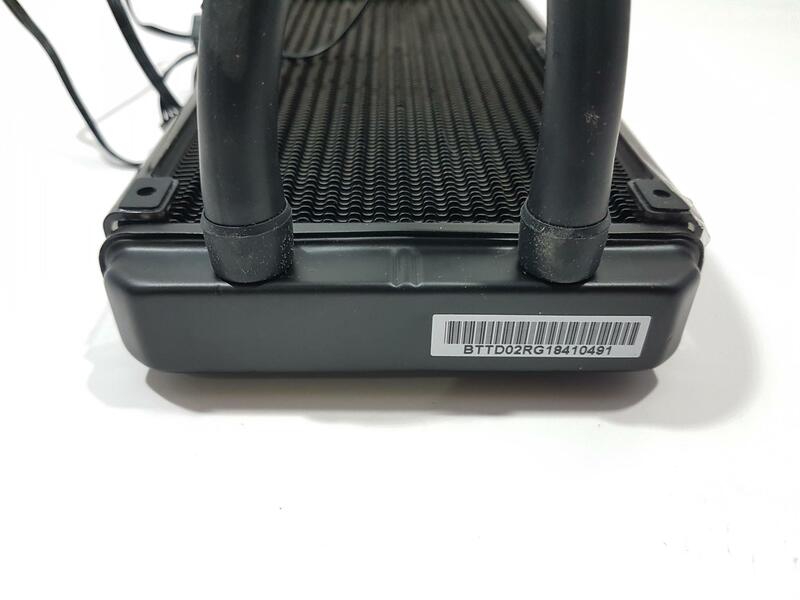 The OEM of their liquid coolers is Apaltek. The dimension of the radiator is 274x120x32mm (LxWxH). 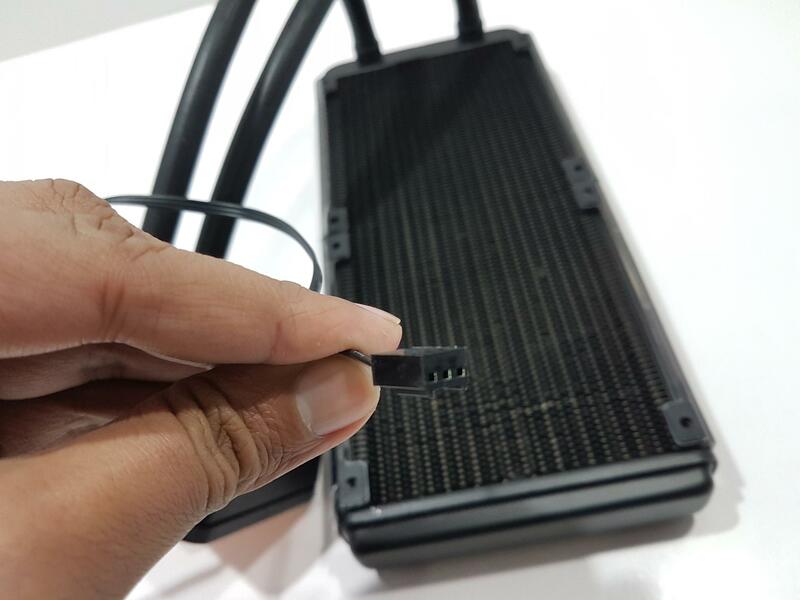 32mm is the thickness or the height of the radiator which is quite more than what are used to see on the AIOs in the market. There is a good reason for that and this is exactly why there are two versions of this cooler. 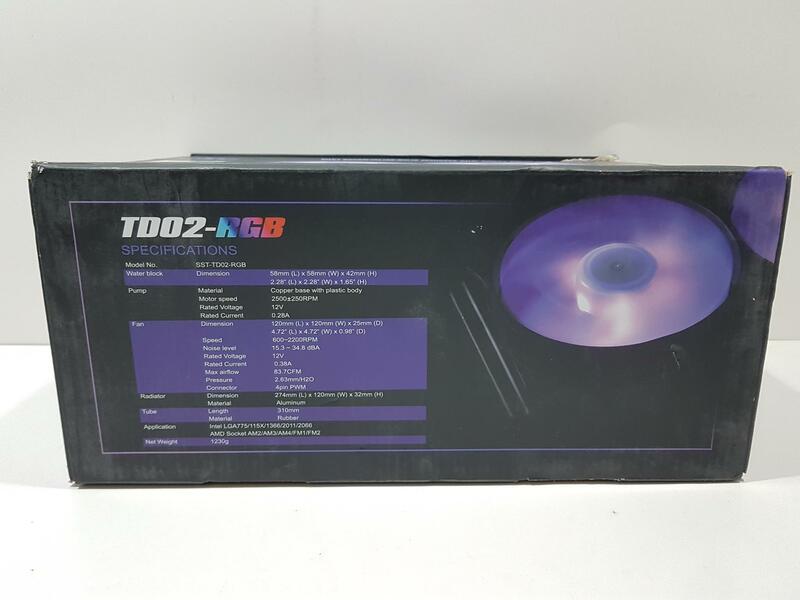 The radiator of V1 or simply SST-TD02-RGB follows the brazing fins design which is something we don’t see in the standard or regular AIOs in the market. The brazing fins give rigidity to the fins structure. Unlike regular fins which can easily be damaged by bending the brazing fins don’t bend that easy but there is a catch to it. Owing to their design limitation, we can’t pack more fins in same per inch area of the radiator which could easily pack more regular fins. Hence we have much less surface area using the brazing fins. The way to overcome this limitation is by increasing the thickness of the radiator to compensate. It is likely that thermal performance may not be at par with what we usually see on the regular fins designed radiators. Above picture is to show you the comparison of both fins design. The top radiator (ignore the dust) is from the Deepcool Castel 240 and the bottom one is from the TD-02 RGB. 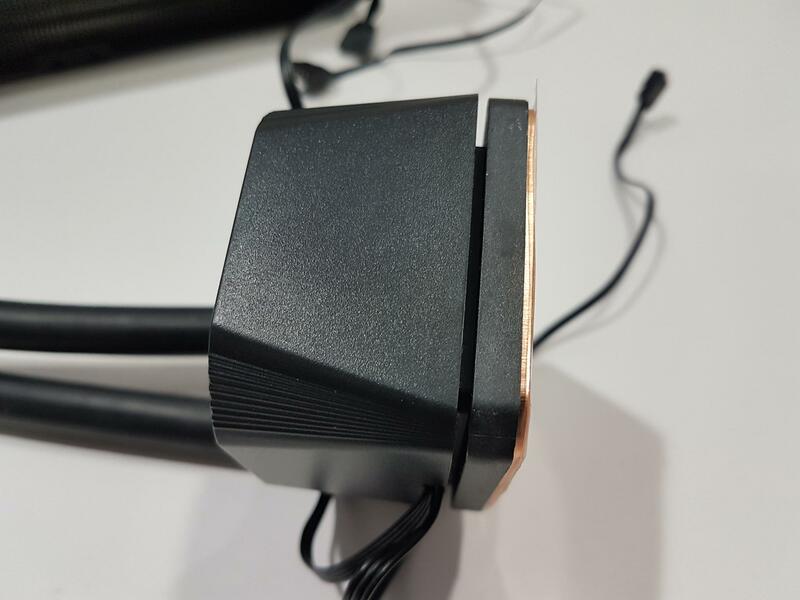 The increasing thickness may lead to the compatibility challenge with the chassis as the overall thickness of the unit with fans installed would be like 59mm or so approximately. 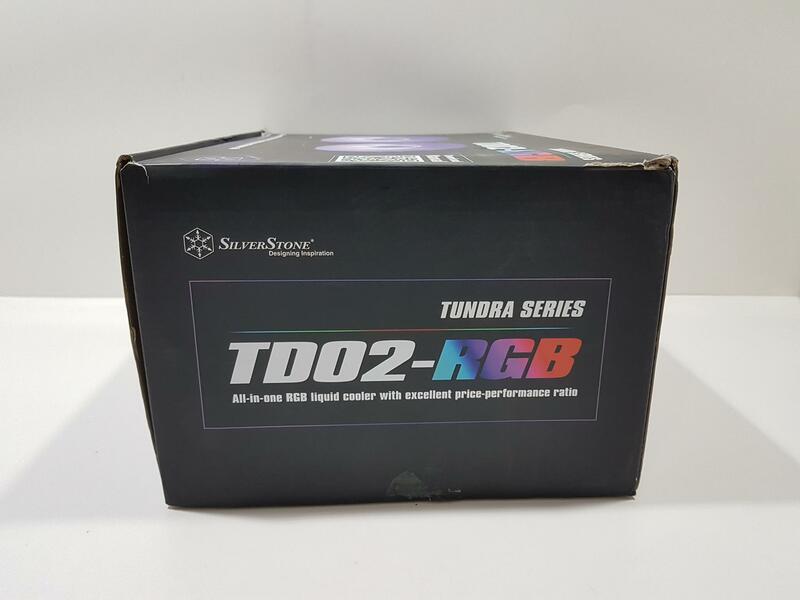 This is very why the SST-TD02-RGB V2 was released with one difference. 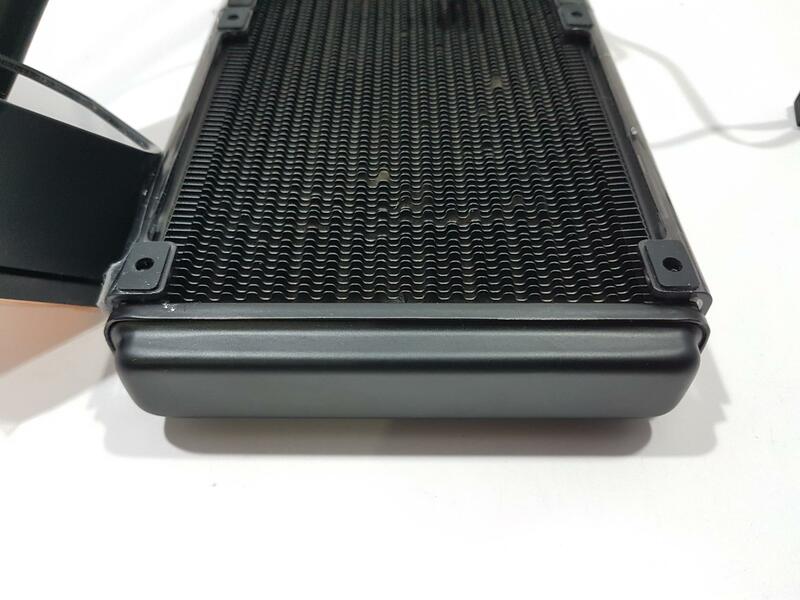 The V2 is using regular fins design on the radiator with thickness/height of 28mm and width of 122mm. The remaining elements of both versions are same. 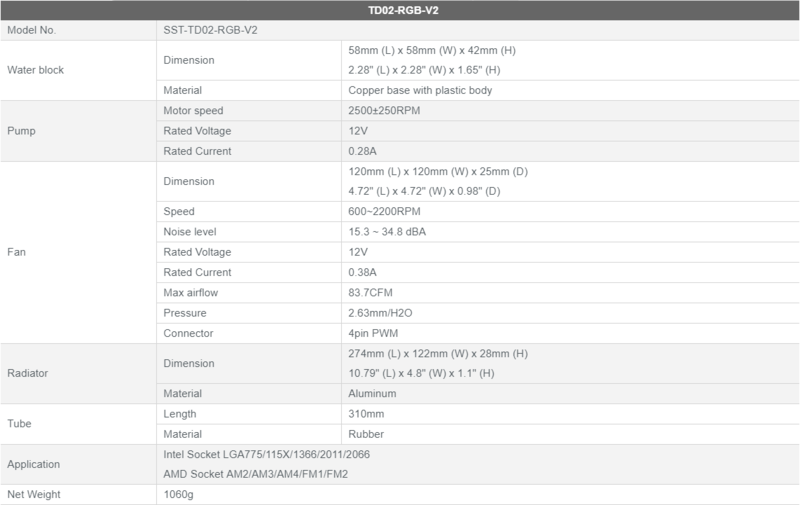 I am taking a look at V1 or simply SST-TD02 RGB unit having brazing fins design. Unfortunately, I don’t have their V2 as it would be a better comparison in terms of thermal performance which is somewhat lacking in the V1 as will be discussed in the testing section. The sides of the radiator are designed differently as well. 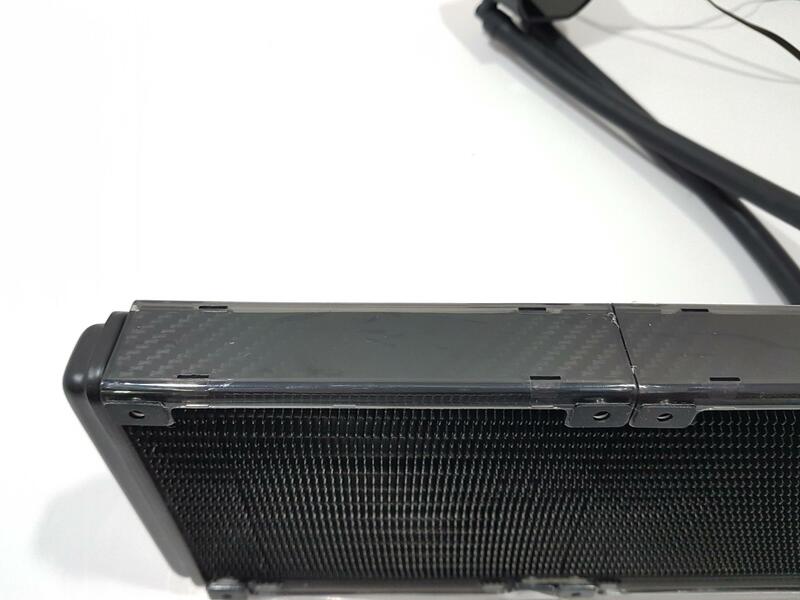 There is a see-through acrylic frame on the sides with carbon fiber wrap on the actual radiator side. This seems to be a purely cosmetic effect as I don’t see how it would contribute towards the overall thermal performance of the unit. 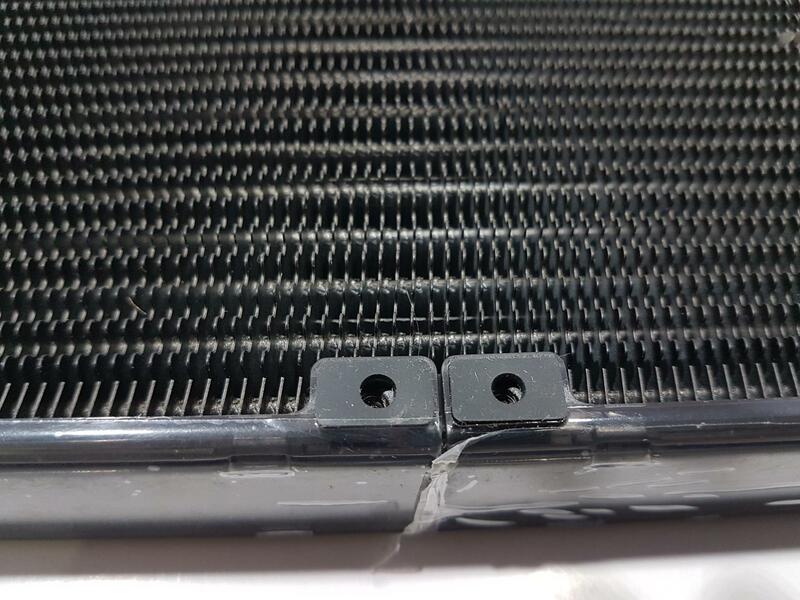 The carbon fiber touch is something that is not apparently visible on the radiator. The mounting holes on the radiator have anti-vibration rubber pads pasted. One of the pads was already off its place when the box was opened and it was sticking to the egged carton. The above picture shows the inner lining of the side frames. Please, note that there is no protective sheet below the mounting holes so take care while screwing fans on the radiator. Although it features brazing fins one can’t be enough cautious! 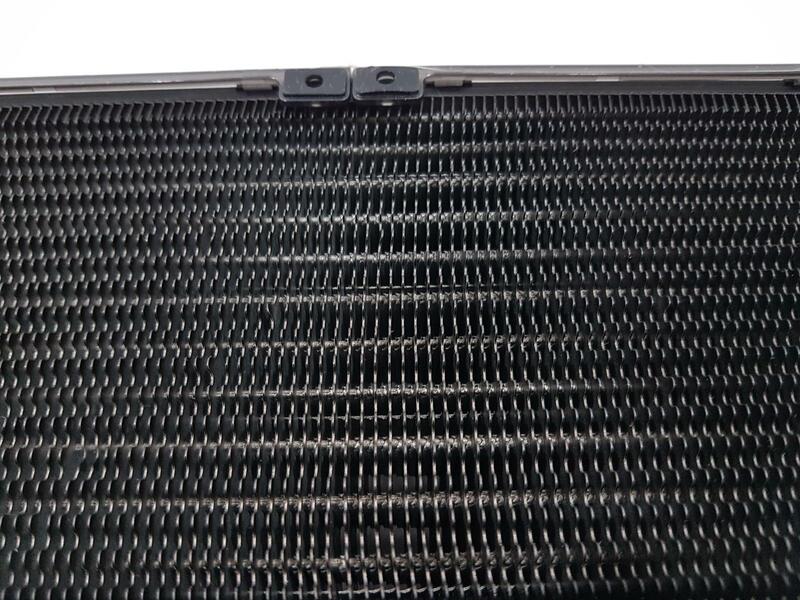 The above picture shows the hoses side of the radiator. A serial no sticker is pasted on its right side. The barbs of the hoses are covered. The far chamber or head of the radiator has a slim design with rounded edges. 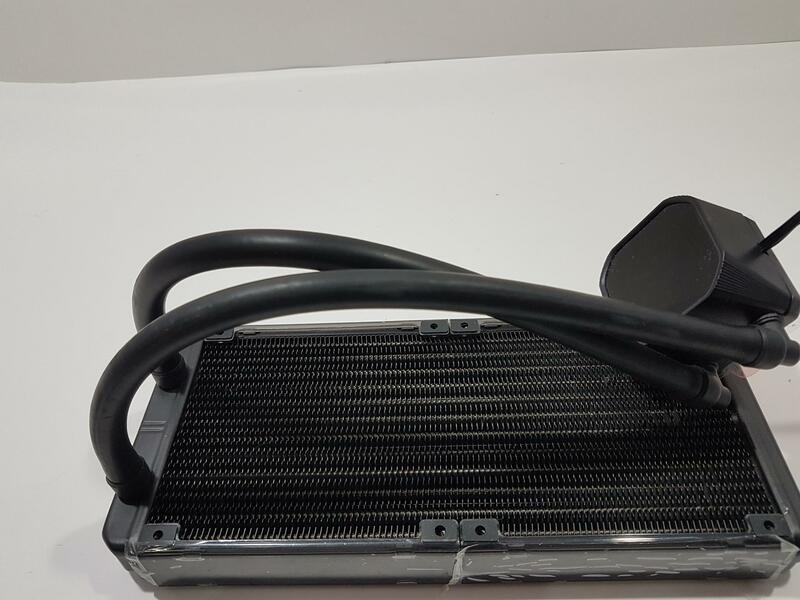 This cooler is using thick, leak-proof (as per the SilverStone claim) rubber tubing having OD of 12mm with braided line. The length of the tubing is 310mm. The water block is made of the plastic material and has a dimension of 58x58x42mm (LxWxH). The top of the block has blackish semi-transparent surface. 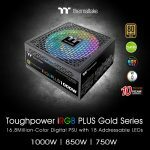 There is a SilverStone logo below the top surface which illuminates in the RGB lighting to create one heck of a look on the block itself. The back side of the block shows the hoses implemented at 90° for rotation purposes. There is nothing else prominent here. Two flat cables are coming out of the unit from this side. One is the 3-pin power cable having a length of 270mm approximately. Other is the 4-pin LED cable having a length of 396+292mm. The above picture shows the simplicity yet elegant design of the overall block on the SST-TD02-RGB. The above picture shows the cutout that runs on the three sides (front, left and right) of the block. This is where the Intel/AMD plate or brackets are slided in. This reminds me of the Alphacool’s blocks design with similar mounting though their brackets are not a single unit like on this cooler. The base of this cooler is made of copper and measures 55x55mm. 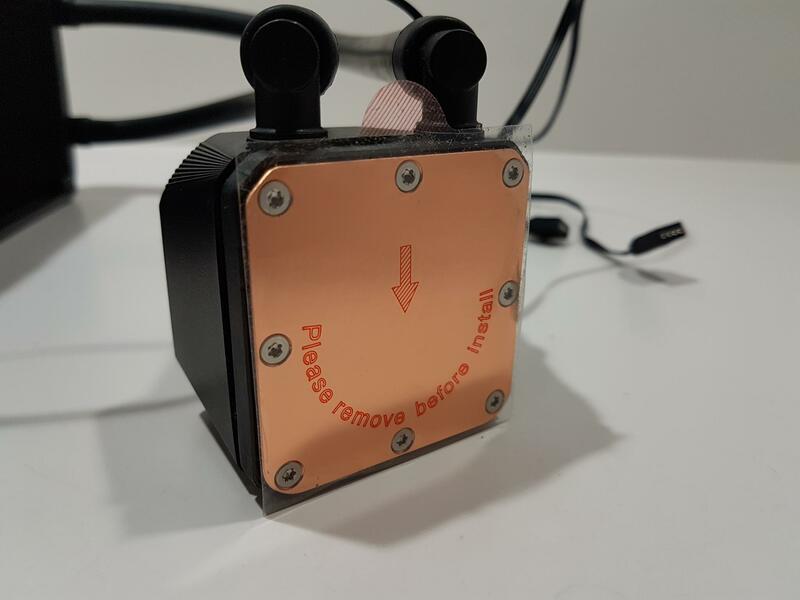 It has a transparent warning sticker pasted on it. Make sure to peel it off before installing the cooler. The pump on this unit has a speed of 2500±250 RPM. It is rated at 12VDC and draws 0.28A. In my use, this pump was reaching 2650 RPM from what I observed in the BIOS. The pump is near silent and I really don’t have any complaint with the noise level of this pump. 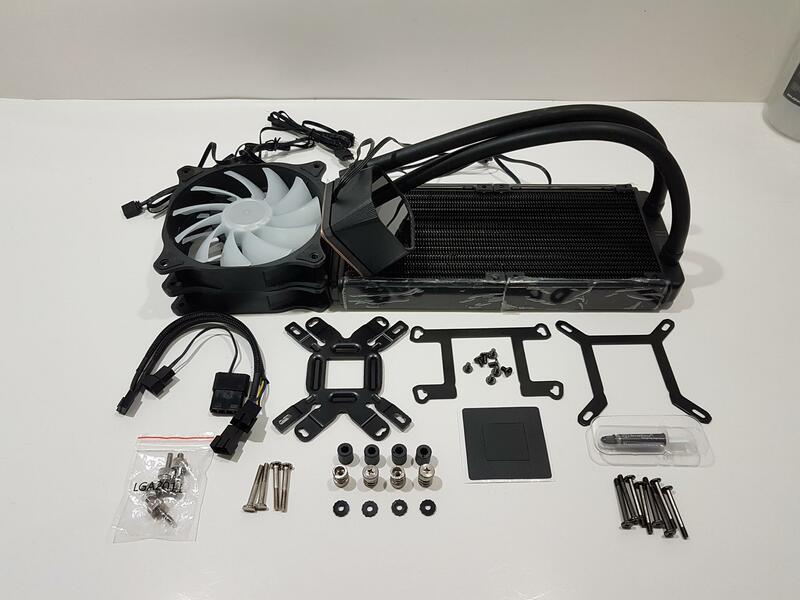 SilverStone has bundled two 120mm PWM fans with this cooler. These fans have 11 translucent impellers. The center on the front is also translucent and has SilverStone brand logo embossed on it. 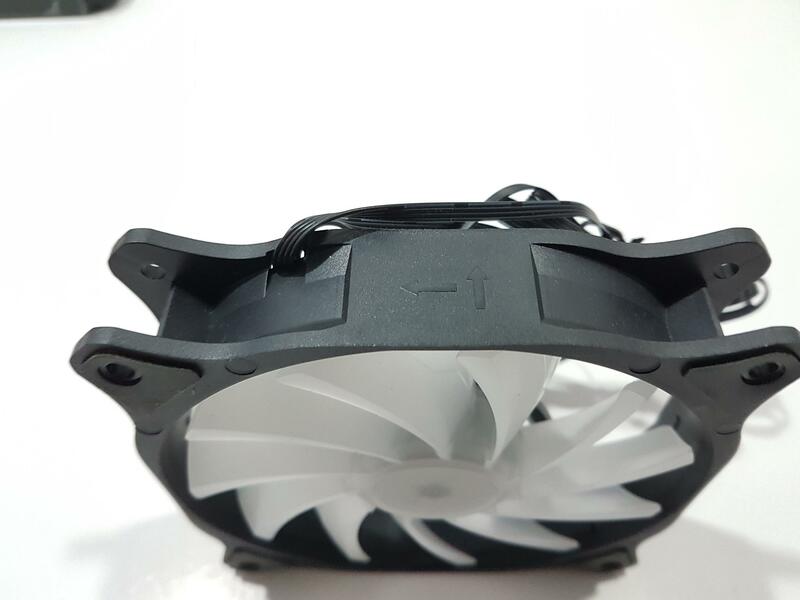 The frame of these fans is in black color. 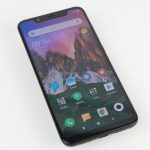 It has slim sides while thicker edges. 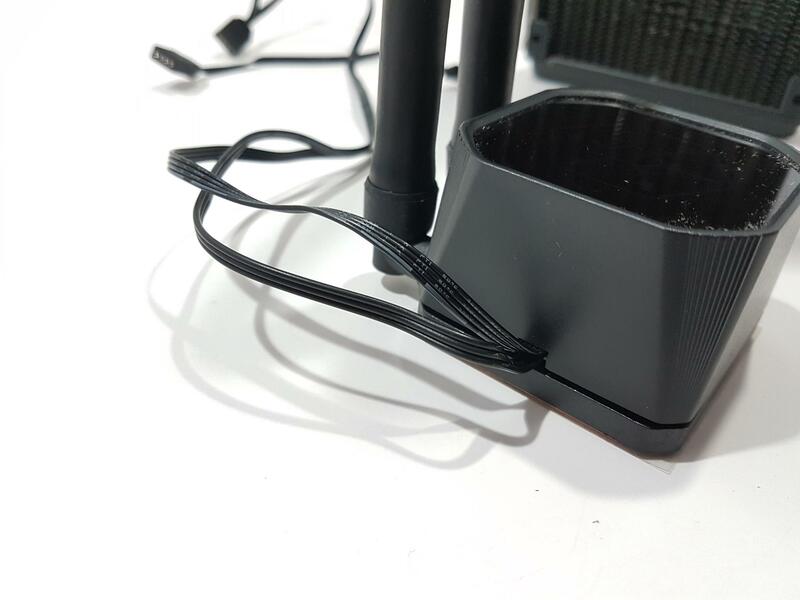 There are anti-vibration rubber pads pasted on the fan mounting holes. The back side of these fans has 4 arms assembly with an arm having more width and inset for proper cable routing. The center on the backside has a sticker with SilverStone brand logo and name printed on the upper half. There are arrow symbols on the side frame from where the cables are coming out. These are there to indicate the direction of airflow and impeller spin. This is a visual aid for the users to help install the fans in the right direction. There are two flat cables coming out of each fan. 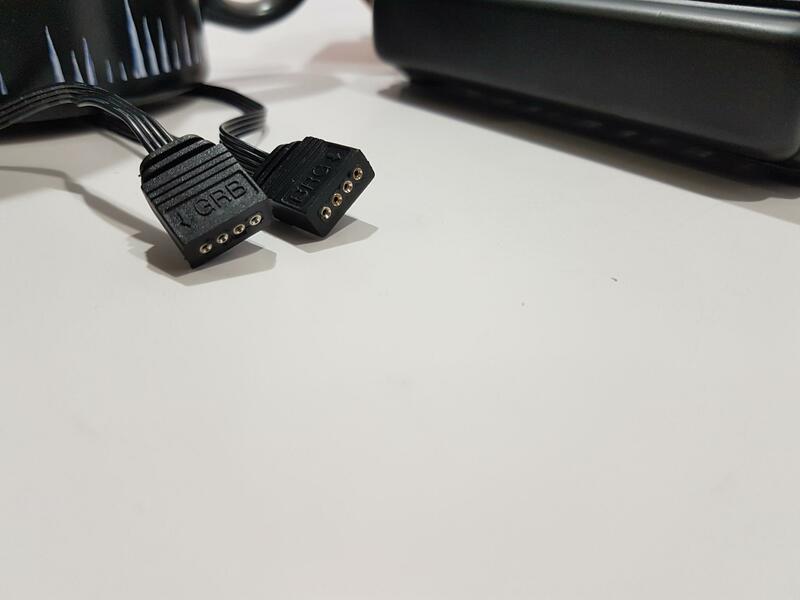 One is the 4-pin PWM cable having a length of 500mm and the other is the LED cable having a length of 975+295mm approximately. In case you are wondering why such a lavish length on the LED cables, it is there for the reason that there is no dedicated lighting controller with this cooler and these cables have to be interconnected or daisy-chained before one end of these daisy chained cables reach the motherboard lighting header. 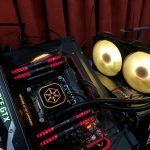 To daisy chain the two fans and block, SilverStone has provided three pin headers. These are used to connect these LED cables among themselves. From the looks of it, this daisy-chaining would result in a series connection, not a parallel one. Install the radiator in the chassis at your preferred place and position. Install the Intel LGA2011 screws on the predrilled holes of the socket nearby area. You don’t need backplate for this socket. Slide the Intel plate on the block. Apply the thermal paste on the IHS of the CPU. 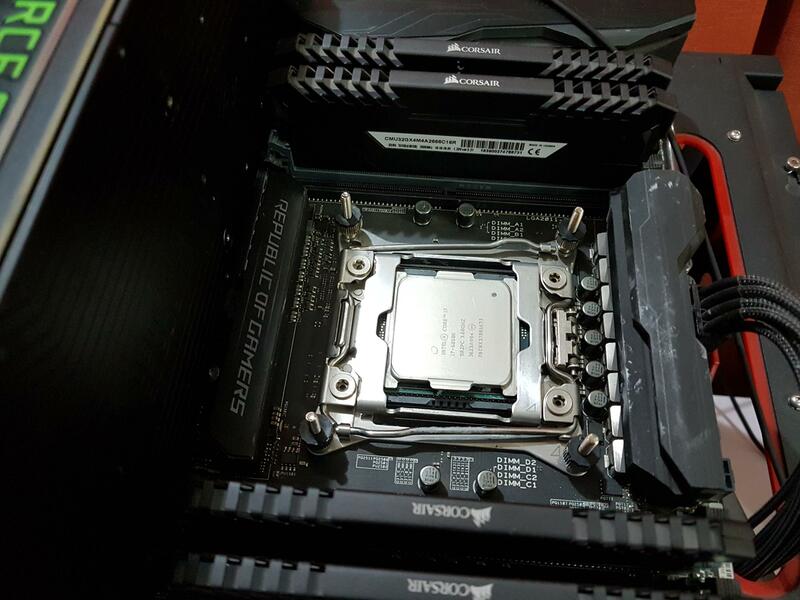 Place the block on the CPU by aligning the already installed Intel LGA2011 screws with the mounting holes on the Intel plate. Don’t forget to peel off the warning sticker from the base of the cooler. Use the spring screws to secure the block on the CPU. Connect the 3-pin power cable of the block to the CPU fan header or any other header of your choice. Connect the LED cables of the block and the fans using the provided pin headers. Connect the single end of the LED cable to the lighting source like an LED header on the motherboard or lighting controller. The benefit of using the AIO is the maximum clearance with respect to the first PCIe slot and the DIMM slots. I did not observer any clearance issue of this cooler with regard to these areas. 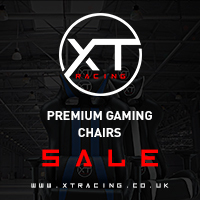 However, make sure that your PC Chassis has enough clearance and provision for the 240mm radiator (with fans installed). 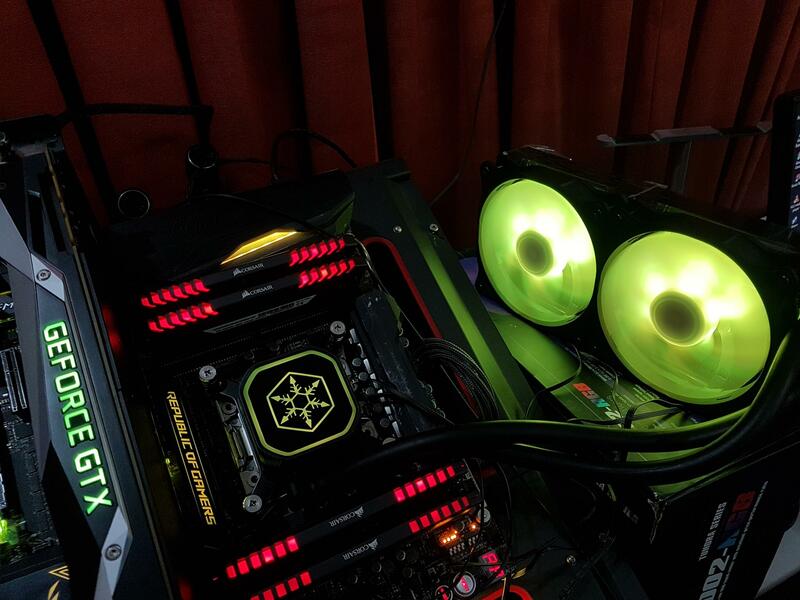 The block and the fans on this cooler are RGB LED lighting enabled. They are following the +12vGRB pin format. 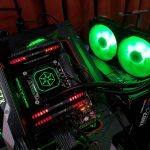 Unfortunately, there is no dedicated controller bundled with this cooler which in my opinion should have been as it would make the life of the users with non-lighting enabled motherboards much easier. 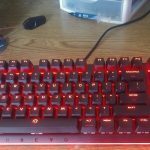 Here are some pictures of the RGB lighting that I controlled using the AURA header of the Asus ROG Rampage V Edition 10 motherboard. I am using Noctua NT-H1 as a standard thermal paste to test each and every cooler on my test bench. The use of same thermal paste will ensure the standardization in the testing and mitigate any performance impact that could come from the bundled thermal paste. Please, note that the coolers are also tested with the bundled thermal pastes and our graphs show both entries. This is to help the users in better understanding of what to expect from a single package. The cooler is tested on the stock clocks i.e 3.6GHz with turbo boost disabled and all cores set to 3.6GHz using 1.130V VCore. The stress test is conducted using the Asus RealBench for minimum 30 minutes. The maximum temperature on each core is summed up and divided by the no of the cores (6 cores in my case) to yield the average temperature. The ambient temperature value is subtracted from the average temperature value to give the delta temperature that is reported on the graph. The same process is repeated with overclocked chip at 4.3GHz using 1.350V VCore. RealTemp is used to monitor the temperatures. Windows 10 x64 version 1803 is used for the testing. 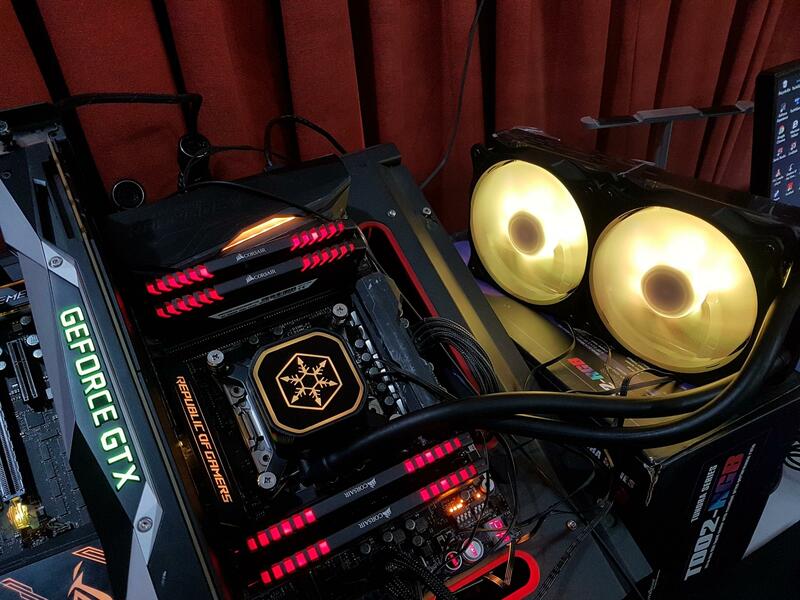 The fans and the pump are set to run at their 100% speed during the testing. On stock clocks, the SST-TD02-RGB has performed very well. There is hardly 0.9°C difference between the stock thermal paste and the Noctua NT-H1. This is indicating that SilverStone has provided premium thermal paste with this cooler. However, the real test of steel is with the overclocked chip at high voltage. 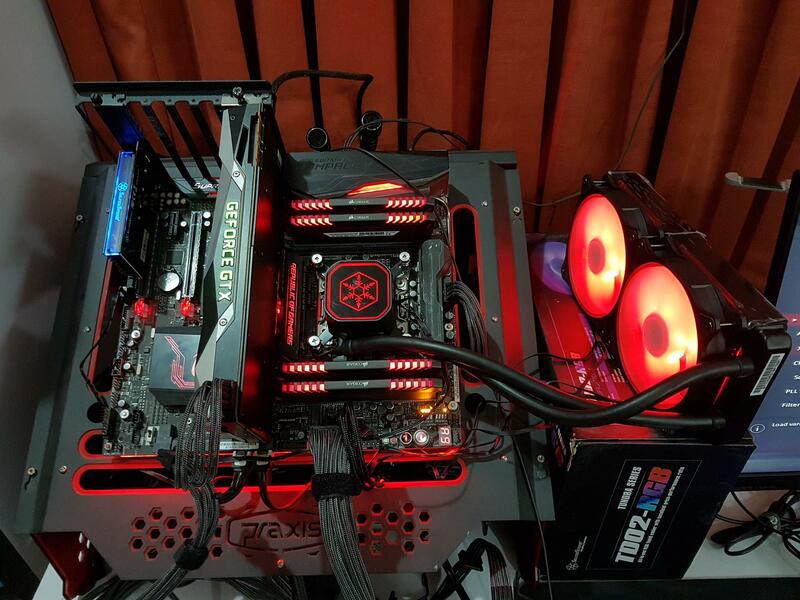 When stress test was run on the overclocked i7 6850k the SST-TD02-RGB came on the bottom of the other AIOs though it is at par with the Cooler Master ML240L and Thermaltake Water 3.0 X240 RGB. Maybe this is the reason they have released the V2 of this cooler with regular fins. Unfortunately, I can’t validate my statement as I don’t have the V2 of this cooler. Due to certain environment noises that are beyond my control, I am not using the sound meter to test the actual noise level of the fans and the pump. 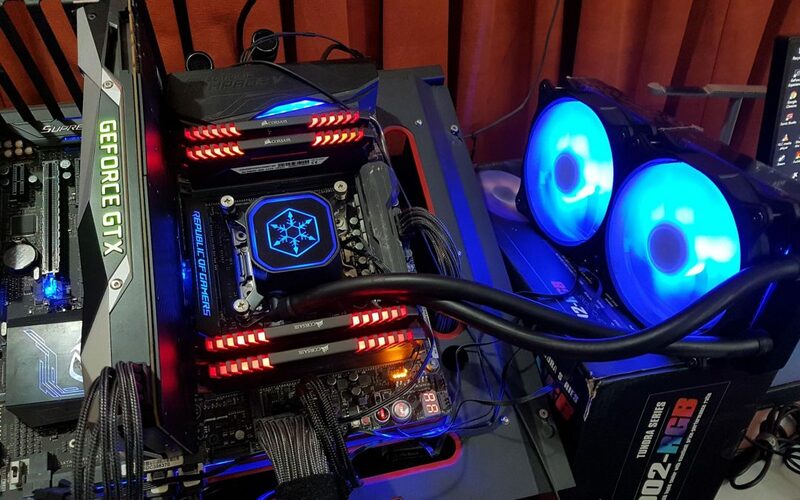 But based on my experience with the fans testing, the fans on this cooler at their full speed are louder and a custom fan curve is in order if you sit near the PC. 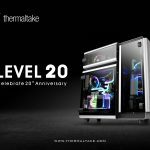 The SilverStone TD-02 RGB is their new take on the Tundra series of the liquid cooling solution for your CPUs. 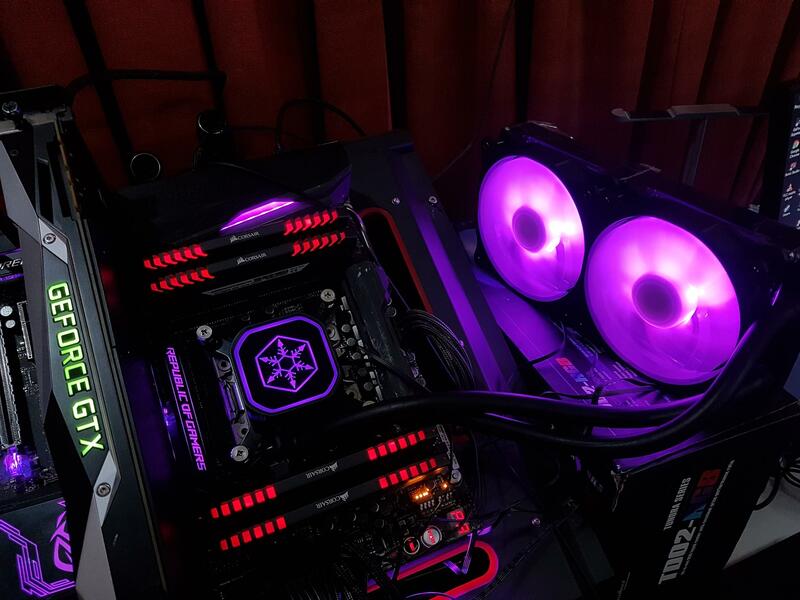 As the name indicates, this cooler has RGB lighting though they are not addressable. 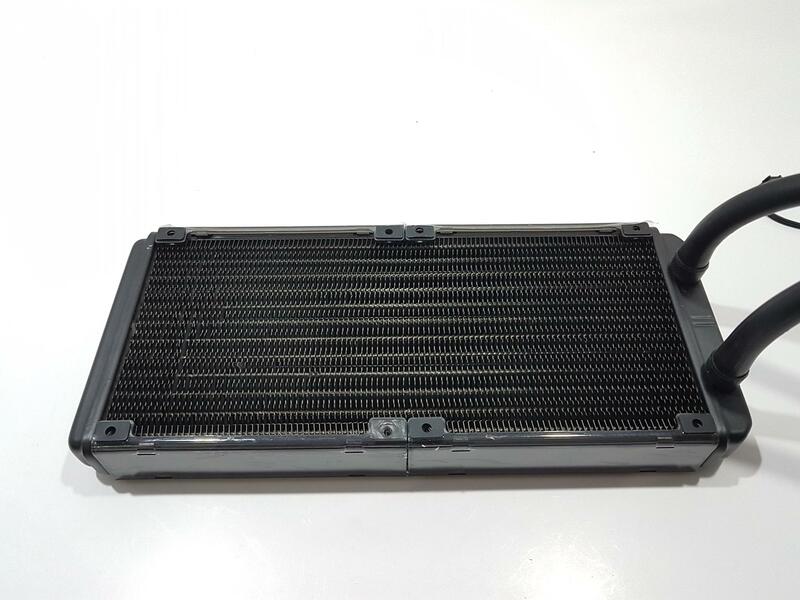 This cooler has 240mm radiator sizing. The SilverStone has released two versions of this cooler. 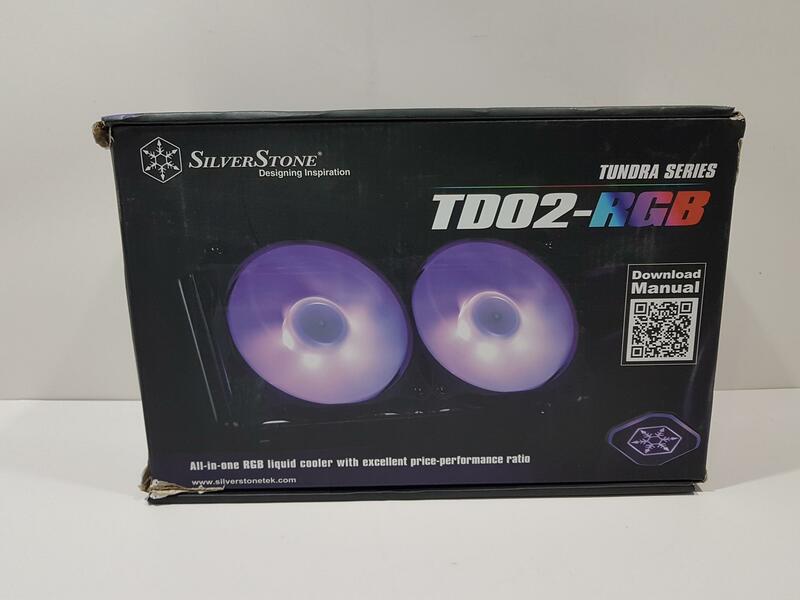 The SST-TD02-RGB aka V1 of this cooler is using brazing fins design on the radiator. The radiator is still made of Aluminum. The dimension of the radiator is 274x120x32mm (LxWxH). Brazing fins have more rigidity as compared to the regular fins but they are not dense enough as compared to the regular fins hence we have less surface area for effective heat dissipation. 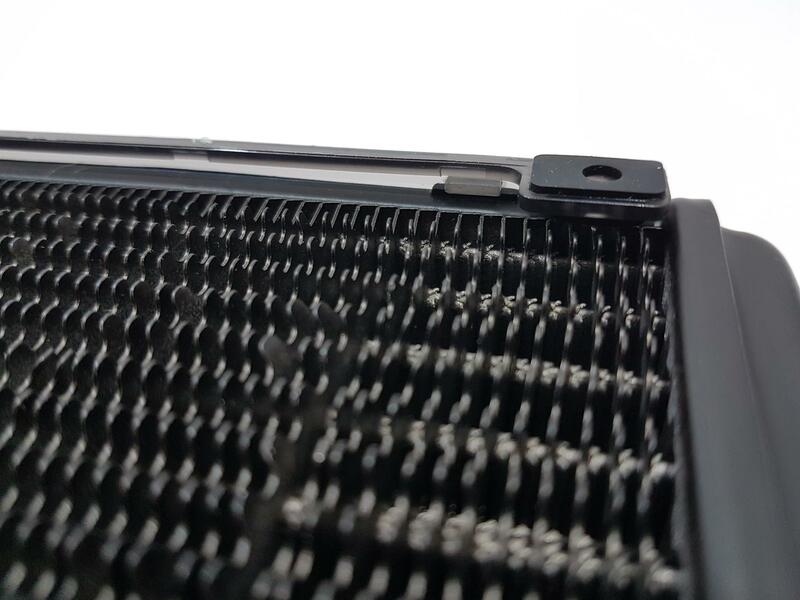 In order to compensate for that, the thickness of the radiator is increased to 32mm. 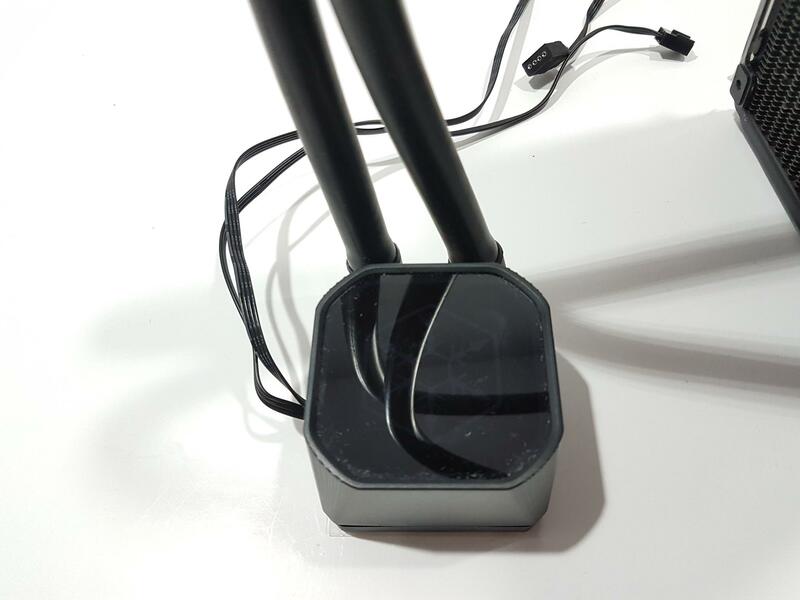 Their V2 version is using regular fins design having a dimension of the radiator to be 274x122x28mm (LxWxH). I could not compare the thermal performance of both designs as only V1 was provided for the testing. 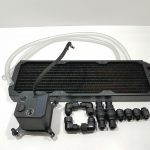 Apaltek is the OEM of the SilverStone liquid coolers. 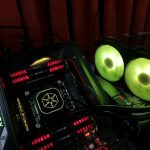 SilverStone will not be launching these coolers in the US due to potential Asetek patent lawsuit hence USD pricing is not available. The cooler is compatible with Intel LGA 775/115x/20xx and AMD AMx/FM1/FM2 sockets. 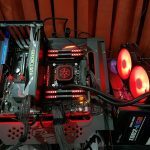 AMD TR4 socket is not supported. 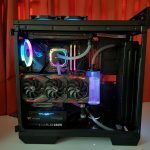 Silverstone is using rubber made tubing on this cooler which has OD of 12mm. SilverStone is claiming these tubing to be a leak-proof design and these have a braided line. The length of the tubes is 310mm. the block is made of the plastic material and has a simple yet elegant finish. 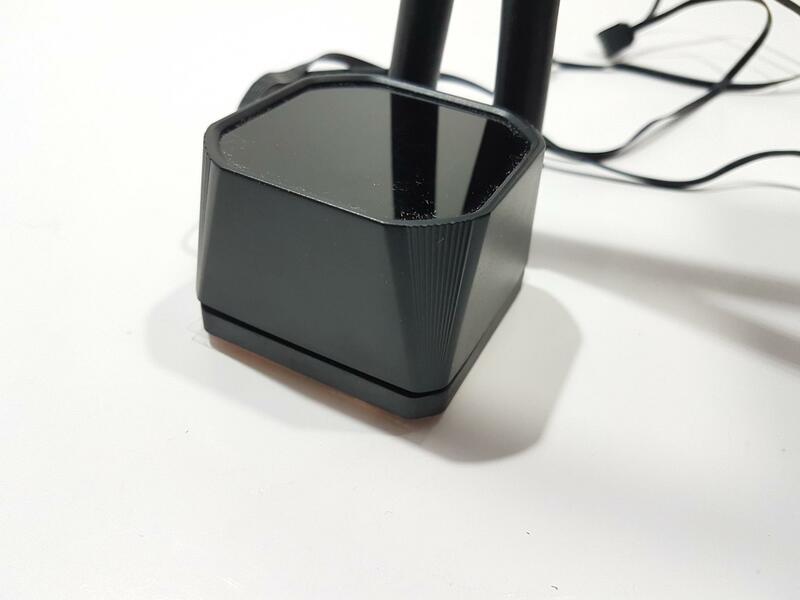 The dimension of the block is 58x58x42mm (LxWxH) The housing has a dark black semi-transparent surface with SilverStone logo underneath it. This logo lights up when powered on. The housing has rounded edges with grooved lines converging at the bottom. The tubes are installed in 90° angle on the block for rotation purpose. The block has two flat cables coming out of it. One is the 3-pin power cable and the other is 4-pin LED cable. 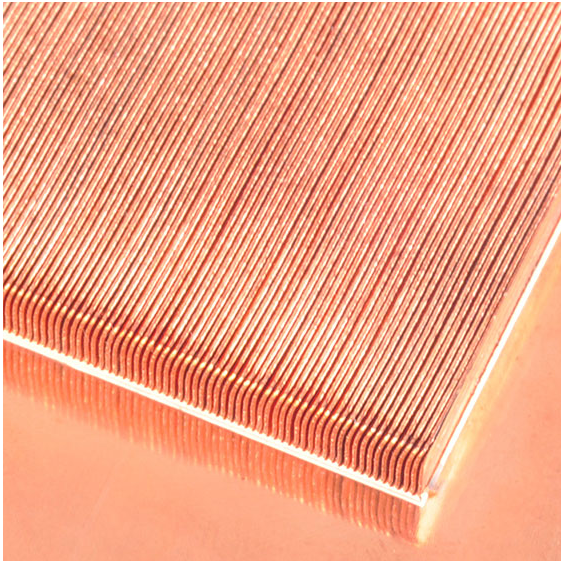 The cooler has a pure copper base measuring 55x55mm and features 0.2mm microchannels. The pump has a rated speed of 2500±250 RPM at 12VDC drawing 0.28A. The bundled fans are 4-pin PWM interfaced for speed control. They are 120x120x25mm sized. They have 11 translucent impellers on the black color frame. Each fan has a set of two cables. One is the PWM cable and the other is the LED cable. The cables are flat to my liking (personal). There are arrow indicators on the side for identification of the airflow direction and the impellers’ spin direction. 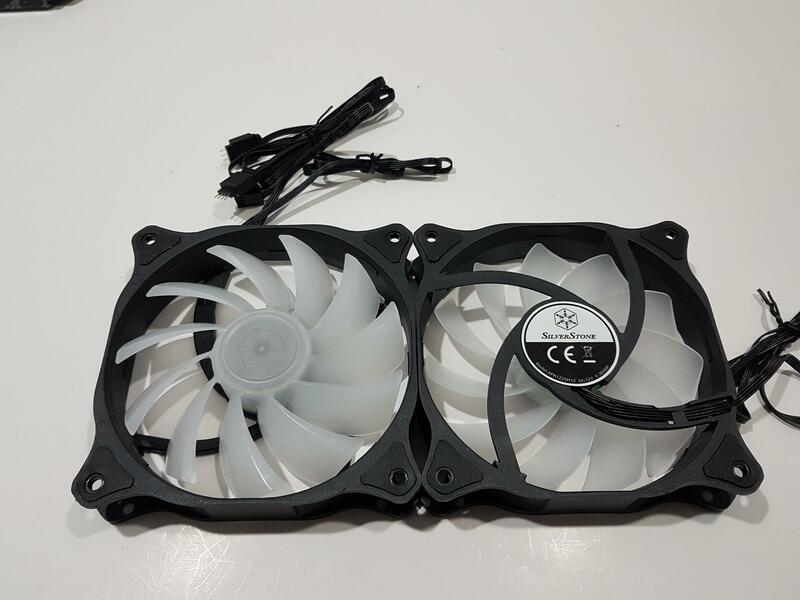 These fans are rated for 600~2200 RPM speed at 12VDC using 2.63mmH₂O. The noise level is rated between 15.3~34.8 dBA. The rated current rating is 0.38A. There is no dedicated lighting controller included in the package. 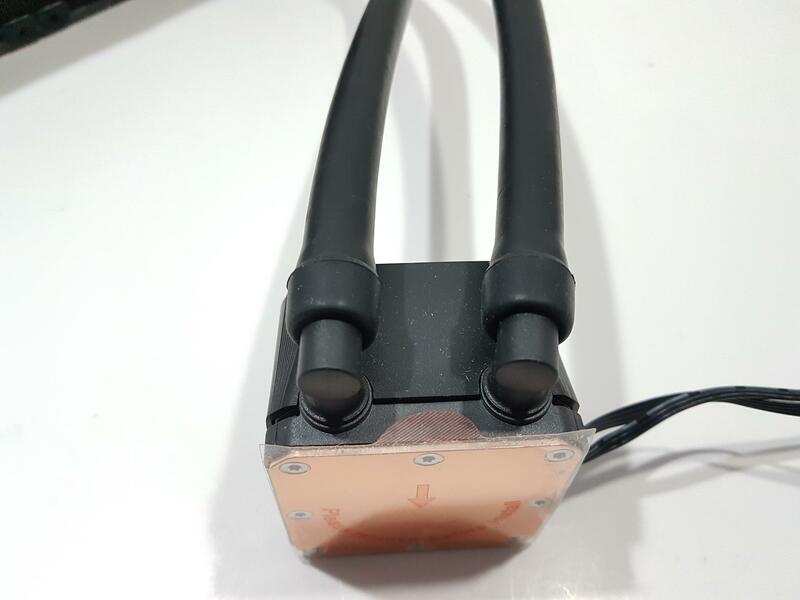 The user is supposed to connect the LED cable to the motherboard lighting header and control the lighting using the motherboard lighting software or use a lighting controller. 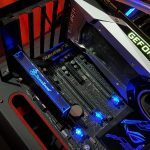 The users who don’t have RGB lighting enabled motherboards would be forced to buy a controller for +12VGRB pin format or use the bundled static blue lighting cable. 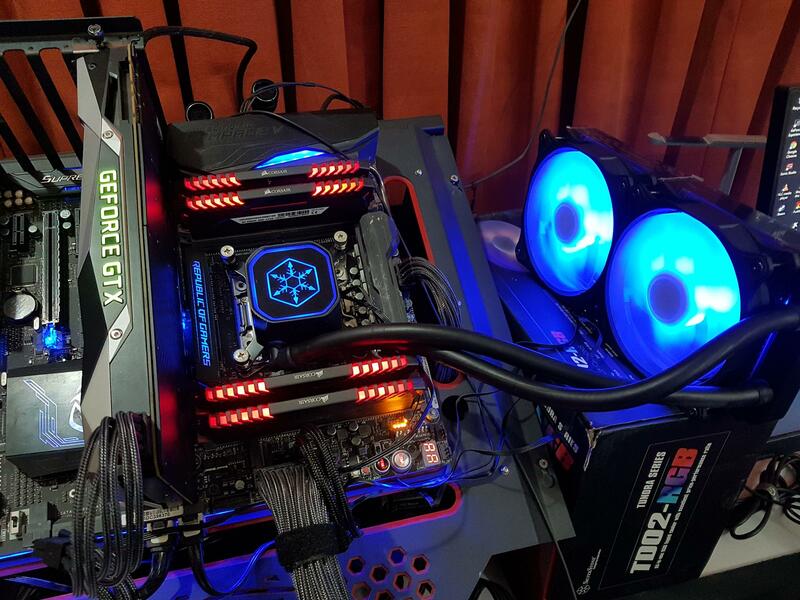 Obviously, using the blue lighting cable would make the fans and the block light up in the blue color only. 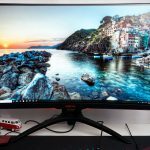 The compatibility/syncing of the lighting with respect to the various motherboard manufacturers’’ lighting solution is not mentioned anywhere. 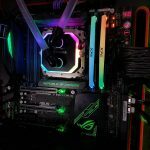 I have tested the lighting control on the Asus motherboard hence I can only confirm that the lighting is compatible with Asus AURA lighting solution. This cooler is rated at 300 AED which would make it fall roughly in 80~90 USD price bracket. Competition is getting tough in this price bracket these days particularly when competition comes with a dedicated lighting controller. 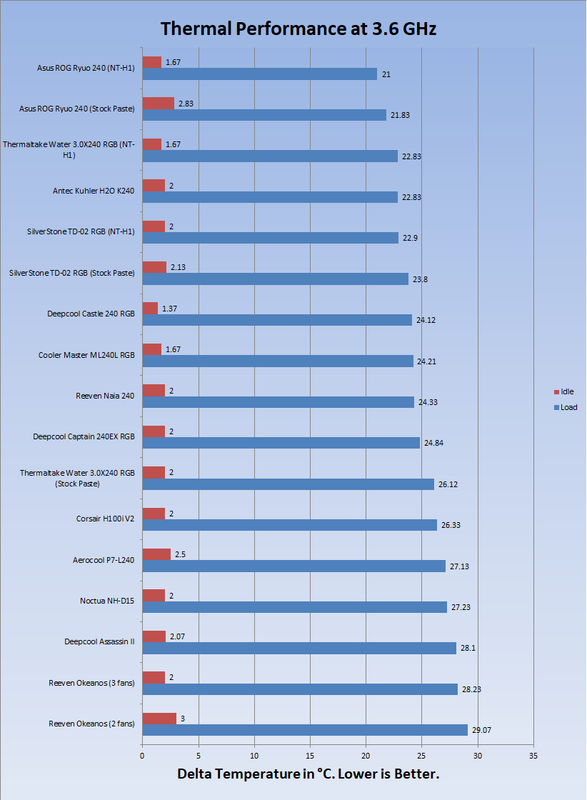 This cooler has performed decent if not better against the other AIOs that have been tested on my test bench. 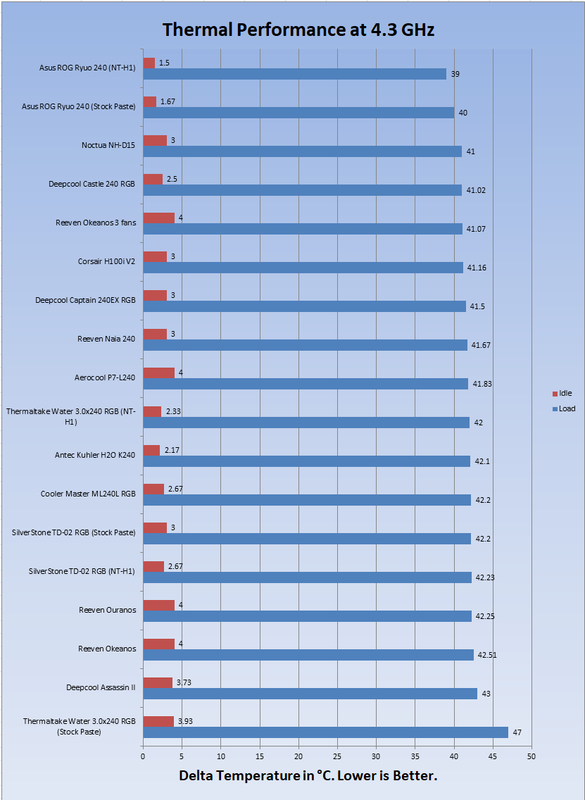 The included thermal paste is indeed good enough as the performance margin with the Noctua NT-H1 is within 1°C. 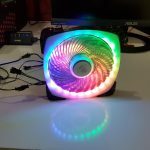 The noise level of the fans is not comfortable at full speed hence I would suggest a custom fan curve. 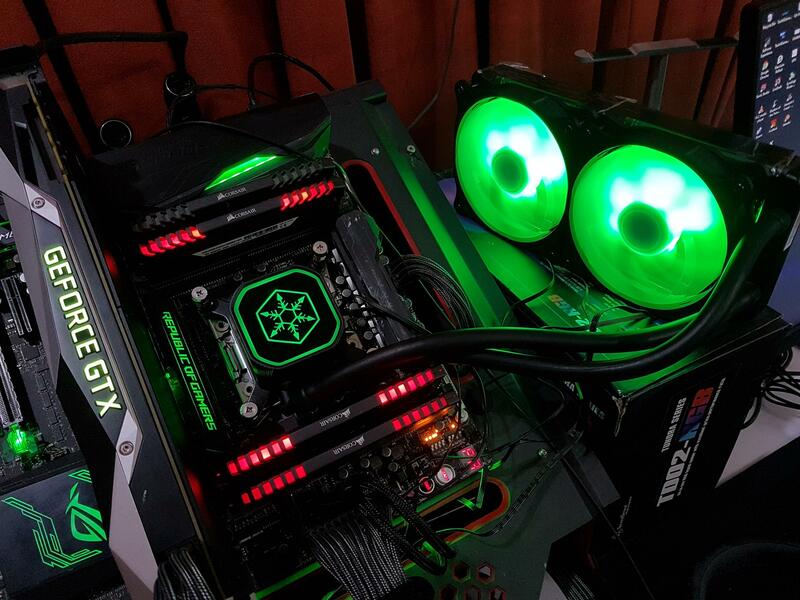 This cooler will and can handle your daily cooling requirement and medium overclocking. 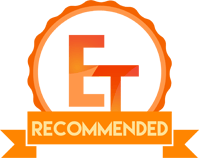 The cooler has in minimum 1-year warranty and comes recommended by us. 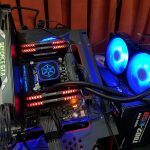 We are thankful to the SilverStone for giving us the opportunity to test their Tundra series SST-TD02-RGB CPU liquid cooler.